Bob Myers: I've moved the following material here since it's of questionable value. 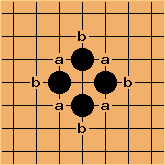 One should avoid the opponent forming this shape because it exerts good influence from all sides. It lays a potential eye. It is difficult to capture this shape too. When one plays at any point at "a". 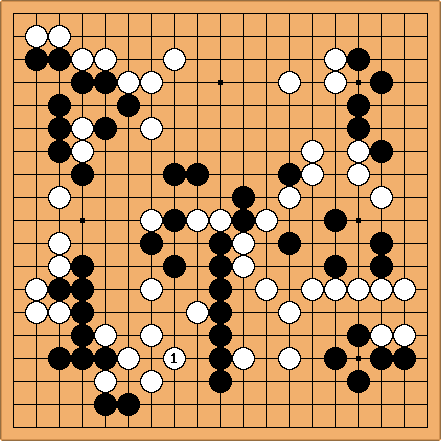 The opponent can extend to "b" and threaten to capture stone at "a" by a ladder. Bob Myers: In fact, it is not that uncommon in pro games to see the diamond shape. Bill: Without contact with opposing stones? Bob Myers: I did some GoBase searches. Searching for a 5x5 area containing the diamond shape at its center gave only two matches, but both were ponnukis resulting from taking a stone. Searching for a 3x3 area just around the diamond shape gave more than 100 matches, but the majority were in the middle game. Leaving aside the ones resulting from capturing a stone, including ko, I found peeps which happened to yield a diamond shape, attachments, life-making moves, and many connections to nearby stones. 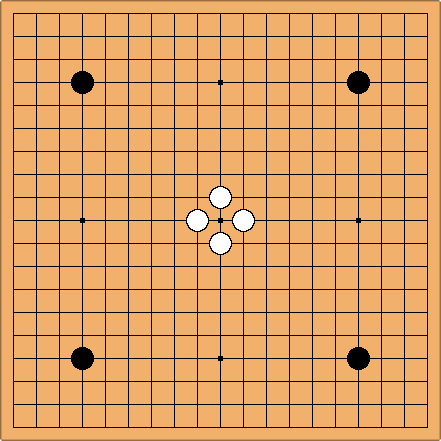 This is a game between Karigane Junichi and Go Seigen played in 1931, where the diamond shape is clearly life-making. Bill: Although Karigane did sacrifice the group. ;-) Strong player. aLegendWai: It is just my idea though. To me, this term is somewhat superfluous. It seems we don't need to go down to this details and classify between a diamond shape and the process of a diamond shape formed by capturing a stone (ponnuki). The formation of a diamond shape will not change its properties/goodness. Eg, When we form a Tortoise Shell ourselves, it is called Tortoise Shell. When we form a Tortoise Shell by capturing 2 stones, there's no special name for the process. And it is also called Tortoise Shell. Although it is surely better for us to form Tortoise Shell by capturing because you form it naturally (without investing extra stones on you own. But it is not necessary for us to make 2 terms for them. By the way, is it only a diamond shape has such kind of a classification? Bob Myers: In fact, whether or not the shape was created via a capture makes a huge difference in evaluating it, and is more than ample grounds for differentiating it via terminology.